There’s an ideal product for every beauty concern. 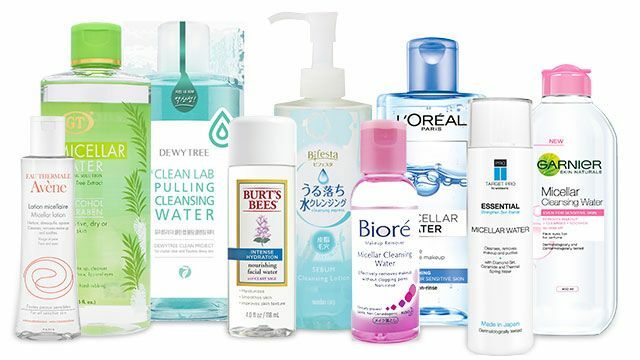 Micellar water is an essential for every makeup lover. First created in France in response to the country's harsh hard water, the solution is made of micelles (tiny molecules suspended in soft water) that cling to dirt, grime, and oil, effectively removing makeup without stripping off the skin’s natural moisture. GT Micellar Water Cleansing Solution is infused with tea tree extract that is just as effective as benzoyl peroxide in treating acne. If you want a makeup cleanser that's equipped with antibacterial properties that will help you avoid breakouts, put this product on your list. DewyTree The Clean Lab Cleansing Water promises to remove the heaviest makeup—including waterproof mascara—in the gentlest way possible. It also contains seawater to keep your skin hydrated with a balanced PH level. Another option is Target Pro, a no-rinse cleanser for days when you're too tired to go through your cleansing routine. It cleanses dirt, oil, and pollutants from the skin without leaving it feeling tight and dry. Burt’s Bees Micellar Cleansing Water contains all-natural ingredients, so you can rest assured that it won’t harm your skin. It's formulated with Australian white cypress oil and honey extract to gently remove makeup, and it’s mild enough to be used twice a day without causing irritation. Bifesta is another good choice, thanks to its water-based option that's gentle to the skin. Biore Micellar Cleansing Water is one of the most popular cleansing waters in Japan, and for a good reason: It removes all traces of makeup and deep-seated gunk in your pores. It also minimizes the appearance of pores for a clearer, more refined look. Removing makeup is not exactly a thrilling thing to do every night, and Garnier Micellar Cleansing Water makes things easier for girls who don’t always have the luxury of time. It removes makeup and refreshes your skin in one sweep. Avene Micellar Lotion has an alcohol-, oil-, and soap-free formula that nourishes the skin as it removes dirt and all traces of makeup. The Avene thermal water also works to soothe and smooth the skin, improving its condition and texture with continued use. Some people have the misconception that makeup removers can dry out the skin. If you fall under the dry skin type, you can opt for a hydrating micellar water that instantly removes makeup, cleanses, and soothes all at the same time like L'Oreal. Products are available from Php P149 to P1,399. Get the best micellar water for your beauty concern by going to any of Watsons’ branches. Follow Watsons on Facebook to know more.